The Cão de Castro Laboreiro was traditionally a livestock guardian that worked with cattle. Livestock guardians do not herd their charges, but instead protect them from prey such as wolves. 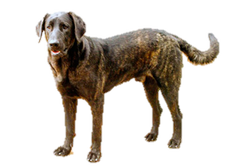 A rare breed, the Cão de Castro Laboreiro is rarely used with livestock today and survives as property guards and police dogs in their homeland. The Cão de Castro Laboreiro originated in Portugal. Their name translates to ‘the dog from the village of laborers’, and comes from the small city of Castro Laboreiro. They are one of three Portuguese livestock guardians, the other two being the Rafeiro do Alentejo from the south and the Estrela Mountain Dog from the central region. It has been suggested that they were developed from crosses involving the Estrela Mountain Dog and local mastiffs (which were likely descended from mastiffs from Asia). Is the Cão de Castro Laboreiro Right for You?